Equine Unlimited Inc | About - Equine Unlimited Inc.
A passion for horses is the foundation of Equine Unlimited Inc., a full-service equestrian facility located in Rescue, California. The park like setting, situated among 23 beautiful acres, is the perfect place for both horse and rider. Malinda Kregoski is the owner and operator of Equine Unlimited Inc., and has over 30 years of experience in the industry. The facility has two lovely barns, several turn outs, spacious pastures and an over-sized outdoor arena with state-of-the-art GGT synthetic fiber footing. Equine Unlimited is pleased to offer hunter, jumper and western riding lessons for any age or level of rider. The facility is open year-round, 7 days a week and has many programs geared for children. Day camps are offered in the spring and throughout the summer months, as well as Horsemanship Merit Badges for Girl Scouts, Boy Scouts and Brownies. Our facility is also a wonderful place to host a barn birthday party or special event. All parties include the use of our gazebo and outdoor facilities as well as instruction on grooming, tacking up and a basic riding lesson on a horse or pony. As a full-service facility, we also offer professional horse training, boarding, leasing and sales. For riders interested in showing, Malinda is a competitive show ring coach, with students participating in local SAHJA schooling shows and rated shows all the way up to USEF “AA” rated events, both in and out of the area. 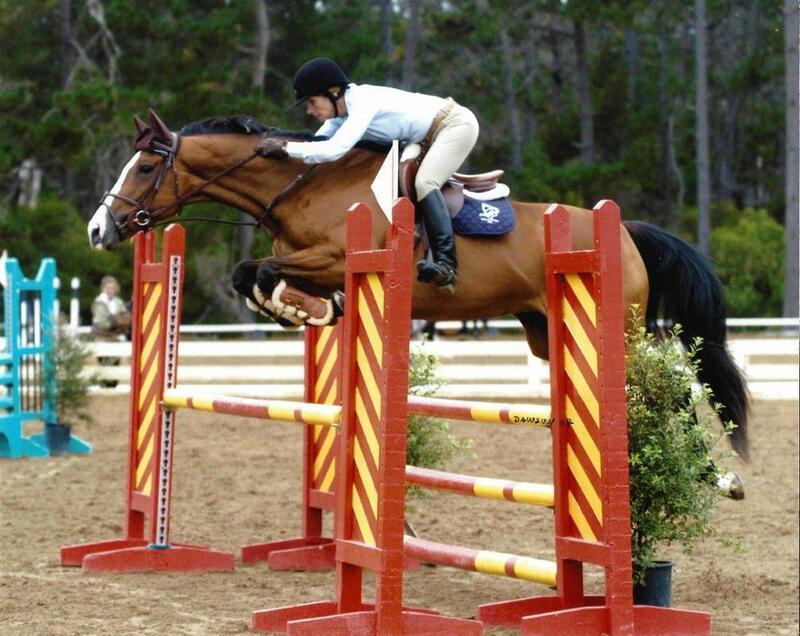 From the new rider to the competitive show jumper, everyone agrees that Equine Unlimited Inc. is the best place to share your passion for horses. We invite you to come by and see for yourself. Team Equine Unlimited - 4 time winners of the Grebitus Cup!! Just minutes off of Highway 50, with ample car and trailer parking. The facility is open year-round, 7 days a week, and all disciplines are welcome. Equine Unlimited boasts two indoor barns, one with attached walk-out paddocks, as well as pipe pens, and beautiful large pastures. There are several round pens for turnout, wash racks, and numerous cross-ties with plenty of shade. An oversized arena is available with state-of-the-art GGT synthetic fiber footing. The footing combines a fabric and fiber lofting agent with fine sand, so it’s gentler on horse’s hooves and legs, with much higher impact absorption for less concussion. ​Light trail riding is available around the property, so you can warm your horse up or down while enjoying the many pretty views. Malinda Kregoski may have been a horse crazy kid, but as an adult she has channeled that passion into a successful equestrian career. Born and raised in El Dorado county, Malinda is excited to be able to share her love of horses with the community. In the summer of 2000 Malinda moved Equine Unlimited, Inc. from her small property in Cameron Park to it’s current 28-acre location in Rescue. The facility has been a work in progress and now boasts two indoor barns, numerous pipe-pens, and beautiful rolling pastures. Visitors are greeted by two bronze horses flanking the sides of the main show barn, when they enter the property. As they wander past the large gazebo they are drawn to the observation area in front of the oversized arena. Chairs are set out along the arena rail, under the shade of a mammoth oak tree. Her extensive background includes three years working with Euro Disney, where she played Annie Oakley in the Wild West show. Building on her English riding foundation, she included cutting, reining, cart driving, and mileage working with all ages and breeds of horses. The show-oriented students at her barn have the advantage of being able to show both in and out of the area. While some of the newer riders like to stick to the local Sacramento Area Hunter Jumper Association circuit, many others attend rated shows, with Malinda, in Southern California and beyond. They are a competitive group and the Equine Unlimited, Inc. show tent is often covered in blue ribbons. Summer is a special time at the barn and from May to August Malinda welcomes riders from all over the area to her horse camps. For most kiddie campers (ages 4 - 6) it’s their first exposure to horses and Malinda makes it a fun one, with riding and horse themed crafts and games. For youth campers (ages 7 +) the day includes riding lessons as well as a hands-on curriculum that includes everything from haltering and leading to veterinary care. ​Set in a park-like environment with room to explore, Malinda has made Equine Unlimited, Inc. into a family friendly, establishment that is a tremendous asset to the community. She hopes her love for the sport will inspire others to come out and join the fun! !